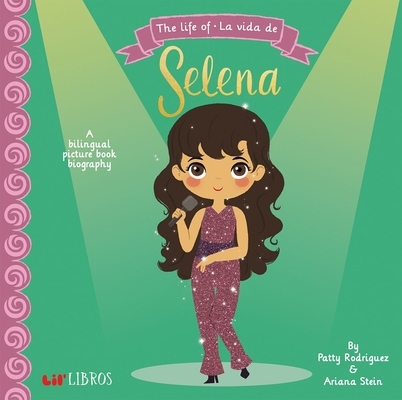 The Life of - La Vida de Selena (Board Books) | River Dog Book Co.
Selena's career started at a young age when she became lead singer in her family's band, Selena Y Los Dinos. She went on to become an award-winning artist with albums like Amor Prohibido and Selena Live, and earned the title "Queen of Tejano Music." Your little one will learn that Selena's favorite food was pizza and that the most important people in the world to her were her familia and fans. Unable to find bilingual first concept books she could enjoy reading to her baby, Patty Rodriguez came up with the idea behind Lil' Libros. Patty and her work have been featured in the Los Angeles Times, Rolling Stone, CNN Latino, Latina Magazine, Cosmopolitan, People En Espanol, Cosmo Latina, and American Latino TV, to name a few. She is currently Sr. Producer for On Air With Ryan Seacrest-iHeartMedia, jewelry designer for MALA by Patty Rodriguez, and creator of Manolos And Tacos. Ariana Stein, a graduate from California State University, Dominguez Hills, has a Bachelor's Degree in Business Administration. Ariana spent the first eight years of her professional career in the corporate world. Her life changed with the birth of her baby boy. She immediately realized that bilingualism played a very important role in his future, as well as the future of other children.